“Cross About The Strike” Original Tie, £40 [+ postage] is being auctioned on eBay.co.uk. Custom designed for TallSkinnyKiwi by Debbie Jones on an authentic, vintage BA tie. Only one available. Viewing available at these airports on Wednesday 31st January: Kirkwall, Aberdeen, Belfast and London Heathrow. Look for this sharp looking man . ..
Story: The British Airways strike has got me a little cross. They told me last week that my flight was cancelled due to the impending strike of Jan 30 and 31. So I booked another flight with EasyJet which cost me £40 to fly from Inverness to London. But now the strike is called off, the flights are back online and I wont be using my EasyJet flight. I tried to change this flight but with the costs involved, it means i am paying out more money for a flight i dont need. So I am walking away from my EasyJet flight and hope to get my loss back through the sale of this tie. 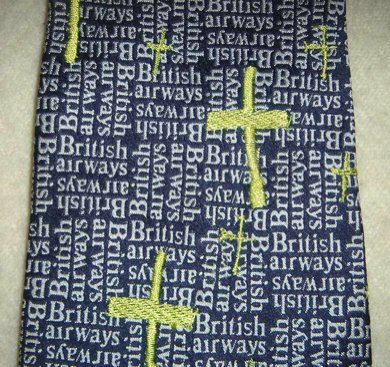 I will wear my “Cross About The Strike” tie on my flight tomorrow from Kirkwall to Aberdeen and Aberdeen to London Heathrow. And then later on that day from London to Belfast. 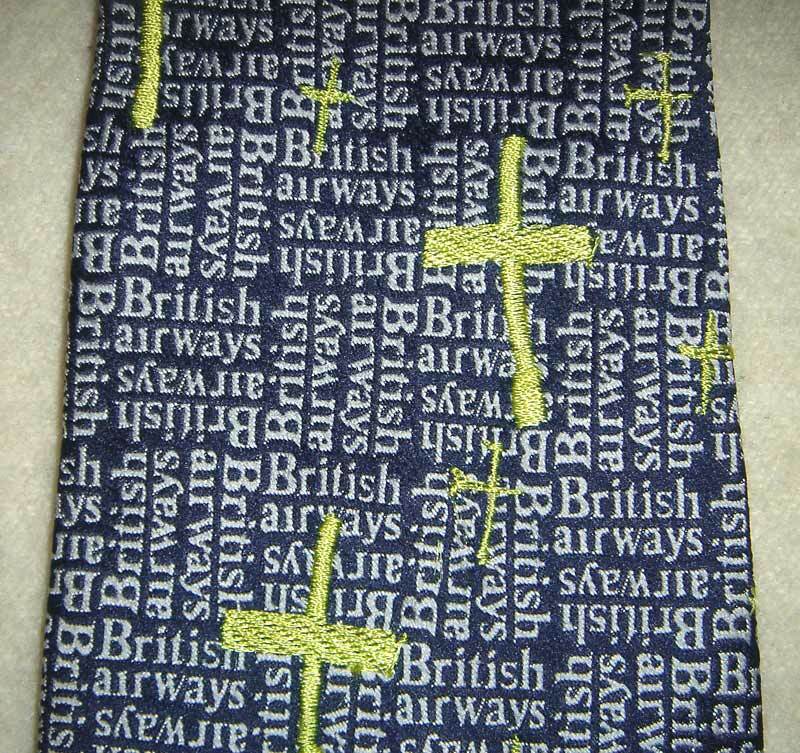 The crosses design is embroidered on an original British Airways tie with quality kiwi green thread. The age of the tie is not known. The cross design is also a nod to the uproar 6 weeks ago when a BA employee was suspended for wearing a cross. BA has since changed its policy and now allows Christians the same right as Moslems – to wear a symbol of their religion. As for the BA personnel who no longer need to strike, “BA agreed to give its staff an 8.5 percent pay increase over three years plus a lump sum of 1,000 pounds (1,800 US dollars) in three payments before September 2006.” [People’s Daily] And while I am overwhelmingly happy for them, I still want my £40 back. I should add that i LOVE British Airways and prefer to fly with them everywhere. With recent price reductions and discounts, I can fly from London to my home in Orkney for £65. And i get treated much better than the budget airlines. Viva BA! I love the tie. Respect to Debbie for the aesthetic beauty and social comment of her art. But…the tie maketh not the man, and I’m not sure anyone else can match you for sartorial elegance! Godspeed on your travels tomorrow. really a smashing tie and i would likely buy it except that my husband will never wear won, even one for such a noble cause. he was recently spotted in a tie for one brief moment for his work permit application photo for Tanzania and they’ve approved it so the Disney tie with the Mickey Mouse print must have worked for him that day. i hope you get more than your 40 pounds back. we agree… we prefer to fly BA whenever possible! I would bid, but am a bit worried about your less than perfect feedback! Shouldn’t your love for BA be spread around a bit? I think your island routes are actually operated by Loganair, “Scotland’s Airline”. I had an interesting trip with them a while ago on their Dublin – Derry route. And I noticed on a trip to Edinburgh last month that Scotland is the “best small country in the world”, the national flag is even more prominent than when I grew up there 50 years ago and begins to carry the weight that flags are burdened with in Northern Ireland. So you may have to watch your national(ist) P’s and Q’s. Sorry, just testing what went wrong with my “interesting trip” link.